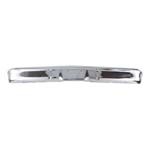 1967-1970 Front Chrome Bumper Chevy Only Includes 5 year warranty against fading and peeling. 1967-1972 Bumper Guards - GM Truck Bumper guards are sold in pairs and come with mounting hardware. 1967-1972 Rear Fleetside Chrome Bumper Includes 5 year warranty against fading and peeling. 1967-1987 Rear Stepside Chrome Bumper Includes 5 year warranty against fading and peeling. 1971-1972 Front Chrome Bumper Includes 5 year warranty against fading and peeling.